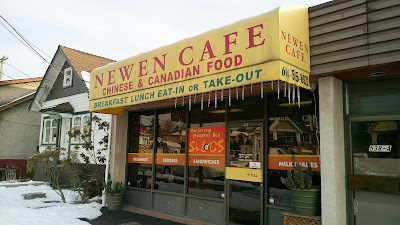 Despite the outside yellow awning that says "Newen Cafe - Chinese & Canadian Food", there's really nothing on the menu that indicates westernized "Chinese" food. Other than a few selections of sandwiches, burgers and "Canadian Breakfast", the orange sign posted on the window pretty much summed up its main offering, silogs. It's a Filipino-style breakfast with savory meats served with over-easy eggs and garlic fried rice. 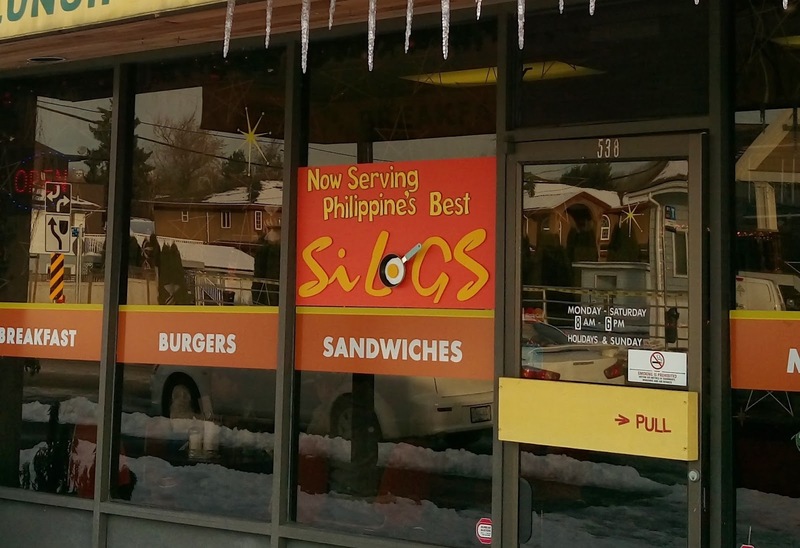 The suffix, silog, was an invented combo of sinangag (fried rice) and itlog (eggs). 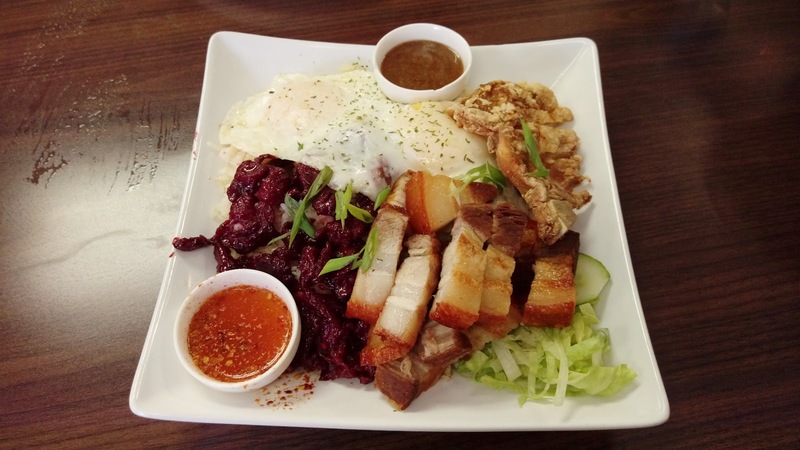 Some of the common mixes are tapsilog (dried/cured meat), tosilog (tocino), bangsilog (milkfish), lechonsilog (crispy pork belly), SPAMsilog, etc. First came my order of Calamansi Juice. Prior to stirring, I took sips of the top and bottom layers. 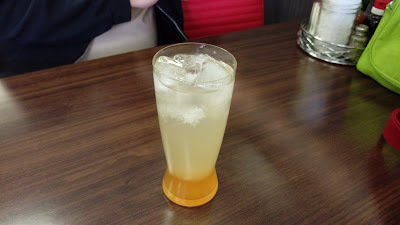 The top was a mix of water and lime while the bottom was calamansi syrup. Since no utensils were provided, it was quite the work to blend the two layers with a low-quality soft straw. Nonetheless, this was delightful and refreshing...even on a chilly day. 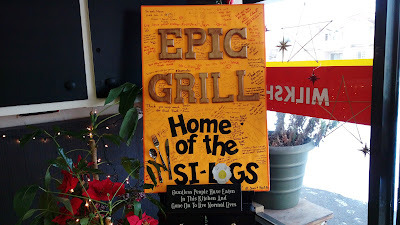 Since it was our first exposure to silogs, we wanted to try as many meats as possible. Buddha Boy suggested to go for Combo #2 and opted for Tosilog (tocino), Chopsilog (pork chop) and Lechonsilog (crispy pork belly). Tocino was delicious. It was slices of pork belly cured with a sweet mixture of salt, sugar, water, wine and food coloring. The flavorless pork chop was disappointing. Not only it was a bit dry and a tad hard to chew, uneven coating of batter also delivered an odd textural bite. We enjoyed the crispy pork belly, aka lechon. The skin was crispy and the meat was moist with a tender crunch. The cut had a higher fat ratio, just the way how pork belly should be. The garlic fried rice was, just as the name suggested, garlicky. Parts of the rice were dry while parts of the rice were still stuck in chunks. The rice was lukewarm. Two over-easy eggs, as requested by Buddha Boy, were done well. Two dips were included. The tangy and sweet lechon sauce had a distinctive liver savoriness with a mellow tone of garlic that lingered. The vinegar dip, on the other hand, had only the sour taste and lacked pungent dimensions. I have hard feelings toward, and disgusted by, those people who would order pork belly dishes then complain nonstop about how fatty the meats were. YOU know YOU ordered PORK BELLY right? Point made. 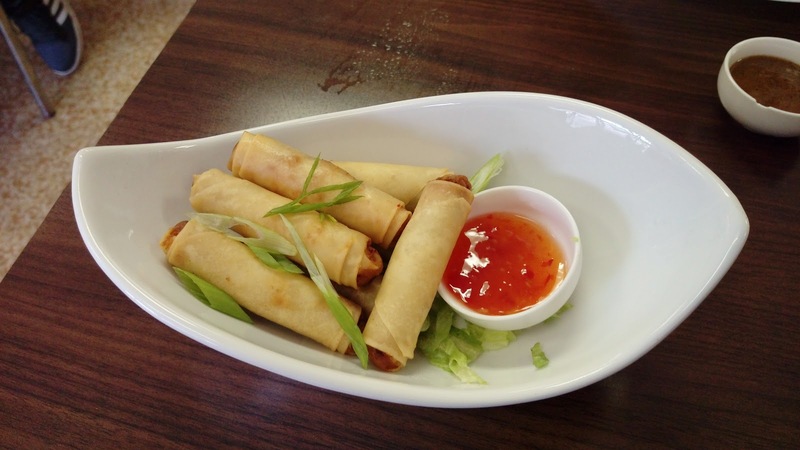 Buddha Boy added an order of Spring Rolls (lumpia). 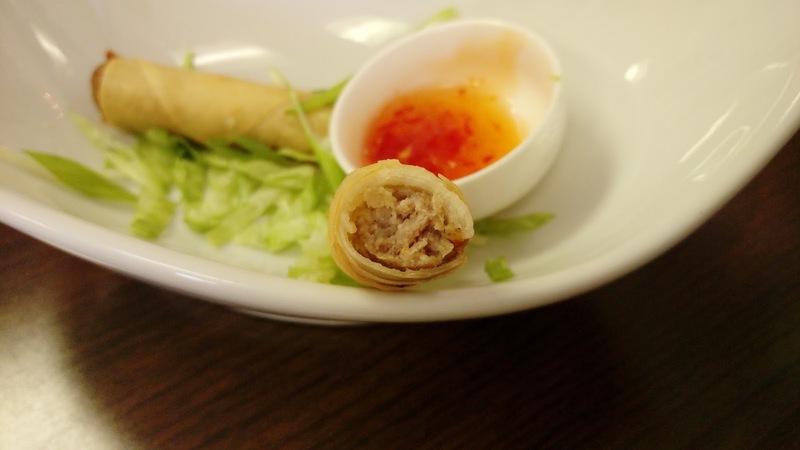 Each roll was tightly wrapped with meaty pork filling that was lightly seasoned. The outer coats of these rolls were pleasantly fried to crisp. The dip was similar to Thai sweet chili sauce. Since we didn't really order enough for the two of us, I had the perfect reason to order a dessert. 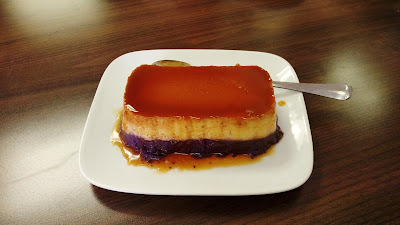 The Ube Halaya Flan was house-made flan with mashed purple yam. The mashed ube had a gritty texture but maintained its peculiar fragrance. The flan was rustic and overly sweet. The restaurant, run by a Filipino family, has a diner setting but it did not feel warm or homey. Service was friendly but inattentive. Upon entering the restaurant, we were not greeted nor instructed so we weren't sure whether we had to wait to be seated or seat ourselves. We ended up doing the latter After going through the wall menu, it took a while to wave down a server to take our orders. When we decided to add a dessert, it also took a while for service. During our visit, the crew hung out in the back (kitchen) most of the time. While we did enjoy the food, we were a bit choked with its pricing and portion ratios. You see, a single meat silog plate is $9.95CAD and a three-meat combo is $19.95CAD. With such a big difference between the two prices, wouldn't it be safe for us to expect that the three-meat combo would be, at least, double in size? Double the rice? Double the egg? Double the meat?. After seeing what other tables had with their one-meat plates, we were discouraged. The three-meat combo, served on a square plate, had similar servings of rice and eggs. The meat? While the portion was more than the one-choice round plates, it was certainly not doubled. The three-meat combo was not a better bang for the buck. In conclusion, we will visit again as we did enjoy the simplicity of silog breakfasts. However, with unbalanced prices, we would only order single-meat silog plates. I'm also curious as to when they'll take down the Newen Cafe awning, it would be strange to leave it up while their window sign is far less conspicuous. Thank you LR! Hopefully the glitches are temporary.